If one follows HI SR31 south to its conclusion, you end up in the ritzy stretch of South Maui in the Wailea/Makena resort area, an artificial creation that looks nothing like the natural world around it but is sold to vacationers as the Hawaiian Paradise. Gucci shops (no lie, there's a Gucci store in Wailea), over-the-top luaus and meticulously manicured grounds contribute to the surreal experience. As I drove through, watching the early morning joggers going up and down the spotless sidewalks, it was all I could do to keep from vomiting. My wife finds me to be some sort of weird reverse-snob. Probably true. South of Makena the pavement narrows and turns a little rough as the scene returns to a more normal Hawaii - dumpy food stands, public beach squalor, crappy cars and the like. I was feeling more at home. I continued south on the road to its end at Laperouse Bay. It was funny to see a French name here on the Islands, the only one I'd seen, ever. There is a memorial along the road that describes how Admiral Laperouse had visited this bay in 1786, the first European to do so. Adjacent to the bay is the Ahihi Kinau Natural Area Reserve which I had just driven through to reach the end of the road. 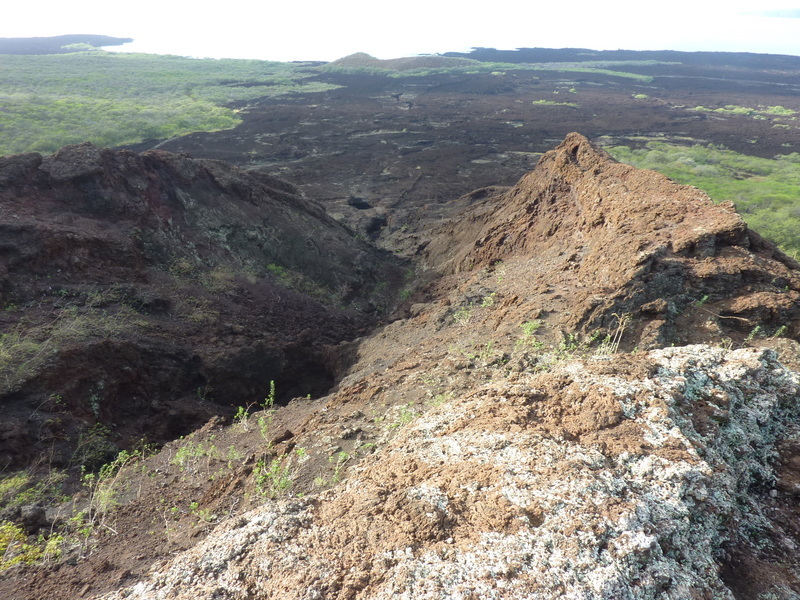 The reserve is essentially the lava flow from the last eruption on the Island. Some sources say the eruption occurred in 1790 which I learned was due to Laperouse not noting this on his charting of the island four years earlier. (A later British captain charted it in 1794, so the nautical historians sort of split the difference). But it turns out Laperouse was a terrible cartographer whose maps are unrecognizable and the science has dated the flow closer to 400-500yrs ago. It's no surprise that history hasn't been kind to the French navy. I had come to Road's End in order to visit three summits on the lower part of South Maui, adjacent to the reserve, about six miles and maybe 1,500ft of gain, all told. The land is almost entirely owned by the Ulupalakua Ranch, the second largest such concern on Maui with 18,000 acres under their control. In the past it was a vast sugar cane plantation, then cattle, now a lot of fallow land left mostly unmanaged. Old ranch roads, occasionally patrolled, course through the lowlands on this drier side of the island. Deer and ferral goats can be found making their home here. A series of old roads shown on the topo map connect the three summits together nicely though access is a little tricky. At the lower end, adjacent to the road I had driven in on, is a horseback riding business that regularly takes clients up the road I was interested in along with a number of side trails they've created over the years. I can only guess that they do this with the blessing (or perhaps are part of?) the Ulupalakua Ranch, which incidently runs Maui's only winery among other modern businesses. I parked at Laperouse Bay and backtracked the road on foot a short distance to a hiking trail that heads east through more lava fields. After maybe a hundred yards on this I turned abruptly north across maybe 50yds of lava to find the road i was looking for. A No Trespassing/Beware of Dog sign was found leading to the riding site. Fresh horse prints were on the road causing me some minor concern, but I saw no one on my way up the road. The first summit, Puu Okanaloa, rises to a modest height above the riding stables and bay. One of the equestrian side trail goes up off the main road to the highpoint making an ascent exceedingly easy. Nice views overlooking the Natural Area Reserve and Laperouse Bay. There is a lower summit to the southeast which I visited as well because I could see it had a benchmark on it, the Hawaiian style of a tall pole with four metal fins at the top. Back on the road, I continued northeast up the gentle gradient for another three quarters of a mile or so until I came to a road fork. I took the left fork which headed towards the second summit, finding the road no longer used by horses or vehicles (the main road had fresh tire tracks as well, no more than a few days old). The unused road was nice since it left me not watching over my shoulder and in less than half a mile I came to Kalua o Lapa, the second summit. The road goes within about 50yds of the summit on the uphill side and makes for a very easy scramble up no more than 20ft to the highpoint. The interesting thing about this one is that it was the source of all that lava that flowed out towards the sea, forming Cape Kinau and becoming the reserve area. From the highpoint you can look down at the breached crater wall and see how the lava spilled out like so much vomit that I was describing earlier. The third summit was only 3/4mi uphill to the northeast, though a little longer with the non-linear road system. I returned to the unused road and continued uphill to a flat area where an old rusting water tank is found and a junction with another (weakly) maintained road with tire tread evident traversing the slope to the southeast. I followed this for only a short ways before turning uphill to start climbing what I thought was Puu Naio. I hadn't looked at the GPSr carefully enough and ended up on an adjacent, unnamed ridge that rises to Pt. 1,369ft, quite a bit higher than Puu Naio. I recognized my error fairly early but continued up the ridge because it was interesting and an easy climb thanks to deer and pig trails. This highpoint gave me a broad view of the surrounding countryside, dotted with a few homesteads but mostly ranchlands. I could look down on Puu Naio to the south and see a picnic bench at the summit along with what appeared to be a homestead at the base on the northeast side. Good to know, I figured. I returned to the good road, traversed more to the southeast along it, then climbed Puu Naio up its Southwest Ridge. A fence surrounded the summit area with a Keep Out / Shooting Range sign which I guessed was a ploy to keep folks like me out. But it turns out it is a shooting range and what I thought was a homestead was actually the shooting clubhouse. The highpoint had a couple of clay pigeon launchers next to the picnic table. I could see a similar arrangement at the lower summit to the east and in the crater area were numerous blinds and rock walls from which to shoot. The place does not appear to be well-maintained, if at all, so I couldn't tell if the range is still in use, but all was quiet this morning. I retraced my route back down from Puu Naio and onto the ranch roads. As I was nearing the first summit I was suddenly surprised to look up and see horses with riders. I stopped about 50yds short, watching as the last of five or six was turning his horse around. I had run across them at the same time they decided to turn the train around which meant that the leader was already at the front of the pack and hadn't see me. The last two riders saw me but didn't say anything, nor apparently report it up the line. I moved off the road and sat down to let the train continue ahead, out of sight before starting again. I let them keep out of sight ahead of me for the remainder of the hike, ducking back into the lava when they returned to the stables. Not sure if it would have even been an issue, but it seemed prudent not to press my luck.